Texas and California — even by U.S standards — are states situated virtually worlds apart, both in distance and culture. It may come as a shock that even well-established companies like Websense and Toyota (along with Google’s Americas Operation Center) have made the move to Texas. What could possibly make tech enthusiasts move from the established comforts of Silicon Valley to a state best known for its ranches and rodeos? Although Texas is often caricatured as an endless desert, in truth the massive state boasts geographical and cultural diversity. Its capital, Austin, stands as testament to this. Walk down Sixth Street for a while (full of street musicians, tie-dye, and the Naked Cowboy) and you may forget that you’re in Texas at all. Despite Austin’s location – more or less in the center of Texas – it is in many ways the polar opposite of the rest of the state. Its creative energy has gained it the reputation as a sort of mini-San Francisco; liberal, forward-thinking and young. For years Austin has been drawing global attention as a tech hub. In terms of job creation in the technology sector, it ranks as one of the top cities in the US. The presence of now well-established companies such as AMD and Dell in Austin in the 1980s has come to provide a base of veteran techies on which to build an entrepreneurial community. Along with the continuous supply of new talent from University of Texas – where the engineering and technology programs rank 14th in the nation – it’s easy to find potential partners and employees for collaboration. The ubiquitous South by Southwest (SXSW) festival is an incredible opportunity for startups, and a can’t-miss event for tech companies. In addition to being a wildly popular music festival, the event hosts a conference which attracts tech businesses and investors from all over the world. SXSW Interactive brings the best minds in new technologies, industry leaders, and investors under one roof for five days of nonstop startup fun, providing businesses with unmatched networking opportunities. By hosting events and meetups Capital Factory provides a friendly platform for emerging businesses to collaborate with other startups and meet potential investors. Capital Factory also hosts programs in collaboration with other organizations like Venture Labs, an accelerator for promising high-school students to promote their ideas. Structural differences between Texas and the ‘Sunshine State’ also make Austin a friendlier place to do business. Local governors have historically prioritized economic growth, making policy towards businesses favorably hands-off. 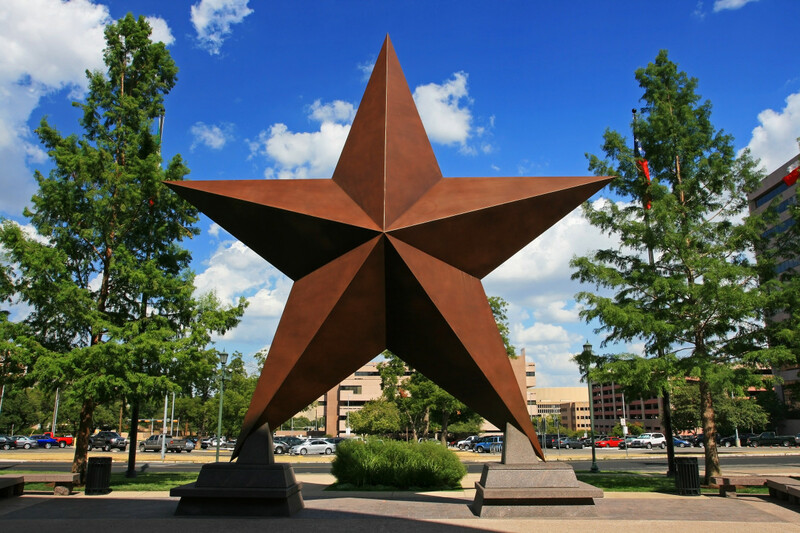 While businesses in the Silicon Valley are subject to corporate and individual income taxes of 8.84 percent and up to 12.3 percent, respectively, the state of Texas charges no corporate or individual income tax. Impressive, though the State’s pro-business legislation goes beyond loosening regulations to aid growth; the Texas government also awards $19 billion in business incentives per year. This money is allocated to businesses for job creation and to help non-Texan companies relocate to the ‘Lone Star State’. With a pro-business state government, you can rest assured that red tape will be kept to a minimum. Its location also seems perfectly primed for business. If you’re doing business in the US, you will inevitably be travelling to San Francisco and New York. Fortunately, Austin is comfortably situated between the two. In fact, the difference in distance from Austin to either of the other two is less than 100 miles. Nearly 150 daily flights depart from Austin to New York, which makes travelling for business a piece of cake. 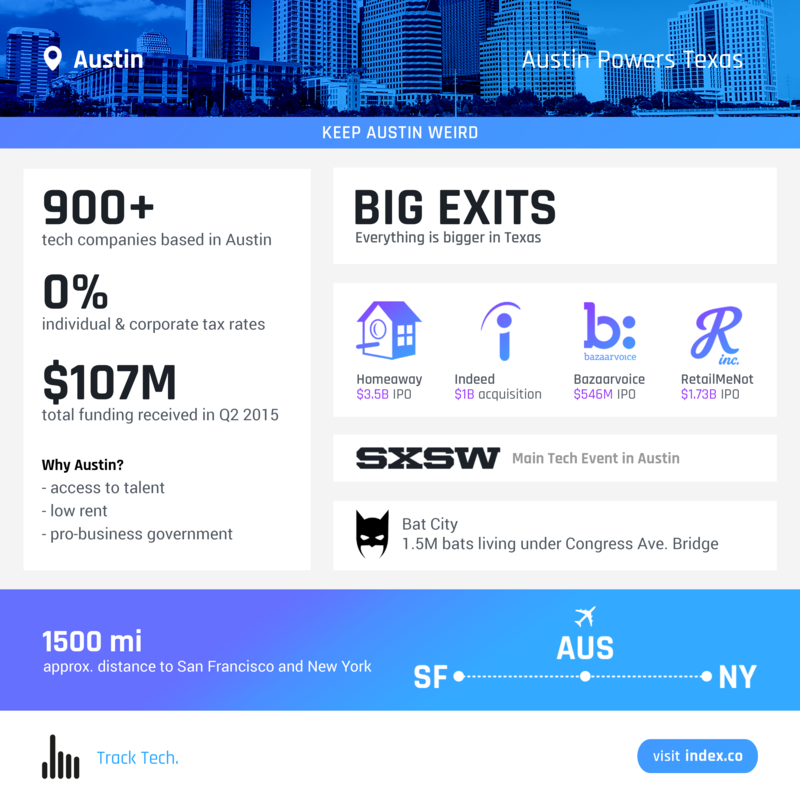 Austin TX boasts over 950 active startups. Out of these, three companies have gone public since 2011. RetailMeNot, Bazaarvoice, and HomeAway can all count themselves among Austin’s success stories after their successful IPOs. Companies from the state capital show no signs of slowing down anytime soon, either. In the second quarter of 2015, Austin-based tech startups hauled in $107M in VC funding. Admittedly, this is a slight downturn from the same period in 2014 when it reached $175M, but things are looking up. In July, Main Street Hub raised $25 million in Series C funding from Vista Equity Partners, Ziften took $24 million in funding (Series C), and Continuum Analytics boosted its capital with $24 million in a Series A round from General Catalyst Partners and BuildGroup. With these three deals alone totalling $73 million, Q3 is looking very promising already. If ATX can keep this up, 2015 will be a super productive year for the ecosystem. It’s also important to remember that doing business in Austin doesn’t have to, and shouldn’t, mean strictly business. Picturesque Lake Austin and the surrounding hiking trails lie just outside the city and beg to be explored on weekends. After work, native and import Austinites can be seen filling Tex-Mex restaurants and the numerous bars of Sixth Street to blow off steam over a beer with coworkers. Many of these citizens will fill Austin’s many concert halls; alongside its status as a state capital, Bat City currently holds the position of Live Music Capital of the World, so there is no lack of entertainment for entrepreneurs-at-leisure. It is perhaps unwise to look to Austin to become the new Silicon Valley; Austin is not, and may never be, a second San Francisco, and it probably should never try to be. While Austin resembles San Francisco in important ways, it is the differences that make it a novel and smart place to do business. Keep Austin Weird.